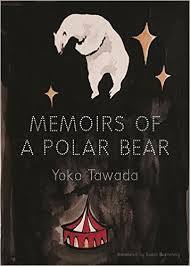 Yoko Tawada’s Memoirs of a Polar Bear is a allegorical novel that is compulsively readable. It is the story of three generations of polar bears, all of whom express a deep-seated need to tell their stories by writing autobiographies, starting with their Russian matriarch. The story weaves its way through the agonies and adulation of life as a captive animal entrapped in various situations; yet the bears find comfort in the attention that comes from performing in front of an audience. At many points this novel has a dreamlike dissonance, exploring the cravings of companionship and sense of purpose through the personification of polar bears. It combines whimsy with a serious study of life under an oppressive political regime and the ways in which nature seeks to right itself no matter what the circumstances.